It was another weather-hit weekend in the Macron East Sussex Football League. More than half of the scheduled matches were postponed due to waterlogged pitches, although 11 league games and one cup tie did go ahead - more than two of the previous three Saturdays during a rather wet January. Bexhill Town in possession during their 5-2 defeat against Rye Town. Premier Division leaders Battle Baptists began their defence of the National Christian Cup with a 5-0 third round victory away to St Albans Romans on a horrible afternoon in Hertfordshire. A Dean Boyd hat-trick and Josh Pickering brace put Battle through to the quarter-finals, in which they will visit Selhurst United (SE London) or FC Cornerstone (Stevenage). As for the league action, Rye Town moved up to second in the Premier Division - three points ahead of third-placed Hollington United having played four more games - courtesy of a 5-2 win against fourth-placed Bexhill Town. In a match switched to Bexhill Road with The Salts pitch unfit, goals from Sam Richardson (2) and Kenny Butchers put Rye three-up at half time. Both teams struck twice after the turnaround, with Richard ‘Alfie’ Weller and Sammy Foulkes scoring for Rye, and Doni Dovla bagging a brace for Bexhill. Bexhill Town and Rye Town battle it out in the rain at Bexhill Road. The other top flight fixture ended in a 4-3 victory for Sidley United at home to fellow mid-table side Robertsbridge United. Chris Phillips gave Robertsbridge an early lead, but Sean Baldwin’s hat-trick and one from Arron Scrace put Sidley 4-1 up before Connor Benton Powell and Curtis Coombes struck late on for the Bridge. Division One leaders Northiam 75 suffered only their second league defeat of the season with a 2-1 loss at home to Wadhurst United. Strikes by Harry Bateman and Matt Harman won it for Sussex Bluefin Junior Challenge Cup quarter-finalists Wadhurst, despite an Oscar Garcia Cruz goal for Northiam. Rye Town forward Richard 'Alfie' Weller tussles with Bexhill Town defender Rhys Whyborne. Although Northiam remain 10 points clear at the summit, fourth-placed Bexhill AAC - their main rivals for the title - are 12 points back and have six games in hand. The other second tier fixture also ended 2-1 as Mountfield United, who were only able to field 10 players, produced a fantastic effort to come from behind and defeat Hastings Rangers. A Sean Smith penalty levelled the scores and Leon Pettit grabbed the winner to put Mountfield third in the table - and level on points with second-placed Westfield II. Matthew Tidmarsh was Mountfield’s man of the match. In the only Division Two game to survive, Bexhill United II won 2-0 at home to Bexhill Rovers to go second in the table. Rye Town forward Charlie Stevens tries to escape the attentions of a Bexhill Town defender. Goals from Callum McDonald and Ben Ferguson lifted United a point above unbeaten Sovereign Saints having played two more matches and within four of leaders Icklesham Casuals. Division Three leaders Punnetts Town preserved their 100 percent league record, but only just after winning 5-4 in a nine-goal thriller away to fifth-placed Sandhurst. Punnetts made it 12 league wins out of 12, despite Craig Walsh (2), James Found and Chris Kember finding the net for Sandhurst. Punnetts remain five points clear because second-placed Sedlescombe Rangers II, who have played two more fixtures, also won narrowly, 1-0 away to seventh-placed Victoria Baptists. Thomas Ellis scored the only goal. 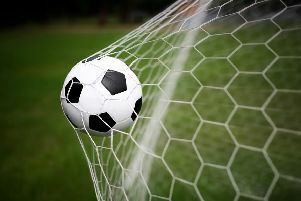 Neither of Division Four’s top two were in action and third-placed Bexhill Broncos took full advantage with a 7-0 victory at home to West Hill United. The Broncos are a point behind second-placed Bexhill AAC II having played two more games and three adrift of leaders Orington having played one more match. Cranbrook Town moved above West Hill into the top six on the back of a 2-1 success at home to bottom side Burwash. The Division Five title hopes of Sedlescombe Rangers III suffered a significant setback with a 4-0 defeat at home to third-placed Battle Baptists III. With leaders Hampden Park not playing, Sedlescombe would have gone top with a victory, but the goals of Lee Costen, Frazer Discala, Jamie Crouch and Gary Thompsett mean they remain a point behind, but having now played an extra game. Wittersham II climbed to fifth by dint of a 2-1 success away to AFC Hollington, whose goal was scored by Aaron Hatton. The league will be hoping a new month will bring a change of fortune with the weather. Plenty of league fixtures are scheduled for this coming Saturday, along with three Premier Travel Challenge Cup quarter-finals, and four teams are due to be in Sussex Bluefin Junior Challenge Cup action.